Do you speed when driving your car? I fix tickets for friends, family and clients. For that, I get non-traditional (as in non monetary) legal fees. I’ve been paid all kinds of beer for tickets, but this client did it right. 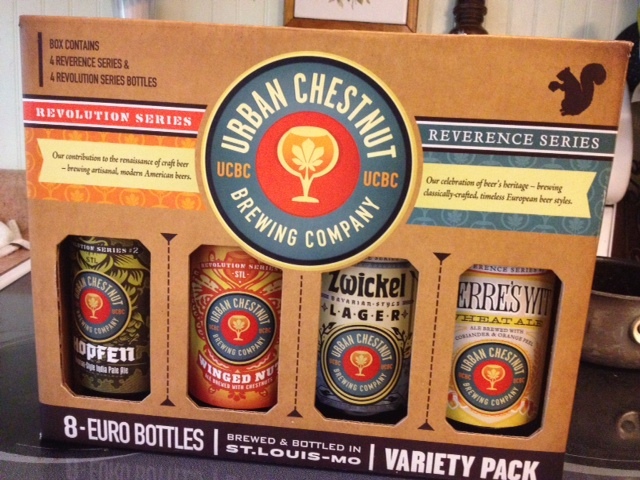 Just this year, I had a modest bar tab paid after some pickup basketball, I was given some Fat Tire by a friend’s adult daughter, and now this bounty of Urban Chestnut. I’ve even accepted a borrowed Keystone Light from an indigent friend client on a night I wasn’t drinking. What can I say… I’m flexible and generous. If you’re speeding in STL, you could go to the cesspool of legal services on Craigslist and pay anywhere from $35-$50+ for getting a ticket fixed, or you could call your attorney buddy (not necessarily me) and offer some suds for a shot at a non-points violation. The bottom line is I hope this particular guy speeds more often because I really enjoy good beer. BBQ & Beer enthusiasts, this one probably isn’t for you (unless you need an IP attorney, in which case you may learn a little about cold-calling). As you might know, my day job entails lawyering. Not just any lawyering, but the specialty known as Intellectual Property. Because of that, I get phone calls. The subject of cold calling a lawyer has been very well-addressed by Ken at Popehat (although we get different types of calls since we are in different practice areas). This post is a little more specific to intellectual property law. I do my best to avoid taking legal work from clients who are going to turn into problems. This is not taught in law school. If Mr. or Mrs. Cold Caller seems like someone who will be a nightmare client or, even worse, a nightmare malpractice plaintiff, then I decline. I prefer to let someone else take on the risk of that type of client – as a solo practitioner with a wife, kids, house, dog, massive student loans, etc., I am exceptionally risk-averse. Each of these things (I swear this is all true) have been said to me. It’s at that point in the call when I know I will never ever agree to take your case. “Invention worth millions of dollars.” – The red flag of all red flags. I hear this MONTHLY. Any iteration of this is an immediate referral out to the bar referral service. It’s a sign of delusion. If you’re deluded about your invention and the chances of becoming a millionaire, then who are you going to be mad at (read: sue for malpractice) when your seven figure check doesn’t arrive? Me. No thanks. “I fired my last patent attorney.” – This isn’t necessarily a 100% dealbreaker, because maybe he/she truly did a horrible job. I can read the patent file online and see the state of the case, but odds are high you are either a pain in the rear client or the application is FUBAR. Either way, my risk-aversion says I’m not the attorney for you. “I filed my own patent application...” – I’m not much of a gambling man. I play a little poker here and there with friends, and I have been known to wager beer during the fantasy football season. But I’ll bet that your application has been hopelessly screwed up by your own hands. It’s a nearly ironclad rule that no one should ever file their own patent application. When the client is looking for someone to blame down the road, it is either them or you… who do you think they’ll choose? “I filed my own provisional patent application 11 months and 3 weeks ago…” – See above. If you file your own provisional patent application because it was super cheap and super easy, you likely super messed it up. You have 12 months from filing to file a non-provisional based on the (probably toxic) provisional. I might be able to help you out in this small window of time, but the earlier filing date is probably forfeit. “The Lord delivered you to me.” – I got this verbatim, followed by lots of Bible quoting and failing to give me the name of the jackass who provided my number. This one was referred to a large general practice firm that I especially dislike. “The FBI is tracking me because of what I have to tell you.” – Not a lie. This guy called me and then showed up unannounced at the office and scared the holy hell out of the receptionist. He was in pajamas, slippers, a robe, had mussed hair, and was obsessed with organizing the sugar packets and pencils at the front desk. Mr. Managing Partner told me that this guy needed to go, so we sent him to the bar referral service. “[Absolutely non-extendable statutory deadline] was last week, but I still want to file. I need [fraud & unethical conduct].” – Sorry, but I’m not risking my law licenses for you. I got this phone call mid-morning the day after Christmas a couple years ago, and a hard 12 month deadline had passed the prior week. Someone really truly asked me to commit fraud on the Patent Office, and I respectfully declined. “My unpatented invention of [ubiquitous product] was stolen by [huge multinational company] and I want to sue.” – This has happened a few times, and the “inventor” can never prove their case. I’m not a fan of being sanctioned by the Courts for bringing cases like this. Cold caller wants me to take their patent application pro bono. – Pro bono work is not often associated with intellectual property. Indigents who are facing an unflinching criminal justice system, or a destitute person being evicted… that’s pro bono work. You don’t want to pay for a patent application? Not quite pro bono work. Cold caller wants me to draft application for free (and pay the filing fee!) for a small slice of their future multimillion dollar company. – No, you sleazeball. Cold caller will only tell me about the invention after I sign an NDA. – I don’t sign Non-Disclosure Agreements. I am bound by the Missouri Rules of Professional Conduct, so anything a prospective client tells me in confidence stays in confidence. (With exception. “I’m off to kill / maim someone…” gets reported to the cops.) If I explain that and they insist I sign, then goodbye and good luck. Cold caller touts their “social network” invention as the “next Facebook” and wants free legal work – Maybe I’ll look back on this with regret, but probably not. Decline. Cold caller’s invention cures a serious disease through a special diet – Yes, I got this call. I hesitate to say the illness, but I passed this single-claim inventor-drafted application on to someone else who handles this type of stuff. I hope the inventor is correct. The one I’m waiting for, and it would make my day: Cold caller has invented a perpetual motion machine. – Please, Jebus, deliver this person and their contraption to me.